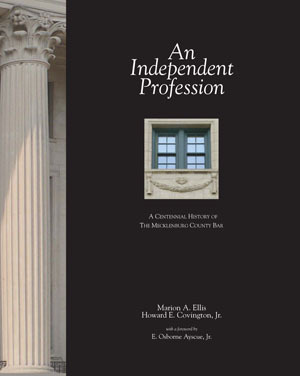 This centennial history of the Mecklenburg County Bar Association offers a fascinating and well-researched account of the legal profession in Mecklenburg County for the past hundred years, with flashbacks all the way to colonial times. But more than that, it provides, implicitly, a thoroughly intriguing history of the community. If you want to understand why Charlotte-Mecklenburg has been a special place – more progressive, more decent and civil – than many other communities its size, you should read this book. For those interested in history, An Independent Profession is an indispensable read. This lively, beautifully written book situates stories of Charlotte and of the Mecklenburg bar within a broader story about America's transformation from a largely rural, agricultural society to a sophisticated international power." This book is a window into the changes our community and society have experienced over the past century. From civil rights struggles, corporate growth, the movement of women into public life, to the transformation of Charlotte from small regional cotton town to major U.S. city - lawyers have been there every step of the way." Anything Ozzie Ayscue has had a hand in, I will endorse." Marion Arthur Ellis, a Durham, N.C. based writer, has authored or co-authored a number of books, including a 50 year history of the American College of Trial Lawyers, a history of NationsBank (now Bank of America) and biographies of Terry Sanford, Frank Kenan, Irwin Belk and Dean Colvard. A former newspaper writer, he was a member of the The Charlotte Observer team which won the 1981 Pulitzer Prize for Public Service. A graduate of the University of Missouri Journalism School, he also attended UNC-Chapel Hill on a Ford Foundation fellowship. Howard E. Covington, Jr. of Greensboro, N.C., is a former journalist who has written more than twenty works of history and biography. Earlier collaborations with Marion A. Ellis include The Story of NationsBank (1993), a biography of former governor and U. S. senator Terry Sanford published in 1999, and The North Carolina Century (2002), a collection of biographical sketches of twentieth-century North Carolinians for the Levine Museum of the New South in Charlotte.